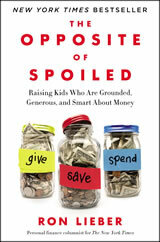 I’m currently reading The Opposite of Spoiled: Raising Kids Who Are Grounded, Generous, and Smart About Money by Ron Lieber. So far, it covers a lot of topics about money and kids that even us adults don’t like to talk about in public. For example, kids and chores. Do you pay them? Should they be expected? What tasks should they handle? As a new parent, I didn’t really think about how controversial this could be. Every couple of months, someone sends me a link to a particular list of appropriate chores for children of different ages. The chart originates with the Montessori school movement, where children use tools at younger ages than most others do and choose activities that the teachers refer to as work. The chart suggests that 2- and 3-year-olds can carry firewood, that 6- and 7-year-olds should empty the dishwasher, and that 12-year-olds ought to do the grocery shopping. Invariably, the sender includes a note with some version of the general message: If only! …we can help our kids act on what Stanford psychologist William Damon describes as a drive for competence. “They avidly seek real responsibility and are gratified when adults give it to them,” he wrote in Greater Expectations, his book about how far our expectations for our children have sunk in recent decades. Indeed, in many urban and suburban families, the chores that we assign them don’t add up to much. 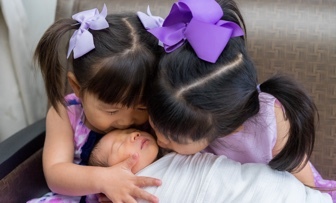 I hope to keep my expectations high of my own little ones, but I won’t go around bragging that “my kids will do that!” just yet. 😉 It sounds like it is more work to get them to do the chores than to just do them myself. But then again, isn’t it always harder to be a good parent than a bad one? Amazing observation. These activities are enough to make a kid productive and creative. Thanks for sharing. Empty the dishwasher into where? Most cabinets where dishes are kept in most homes are out of reach for young kids. Maybe the silverware. These days it is very difficult to make the kids do their chores. You might need to bribe them like “extra 20 min video games for this chore”. With preteens and teens, asking them to keep their room clean itself is a monstrous task for parents. I agree that being a good parent is harder than being a bad parent (or “don’t care” parent). 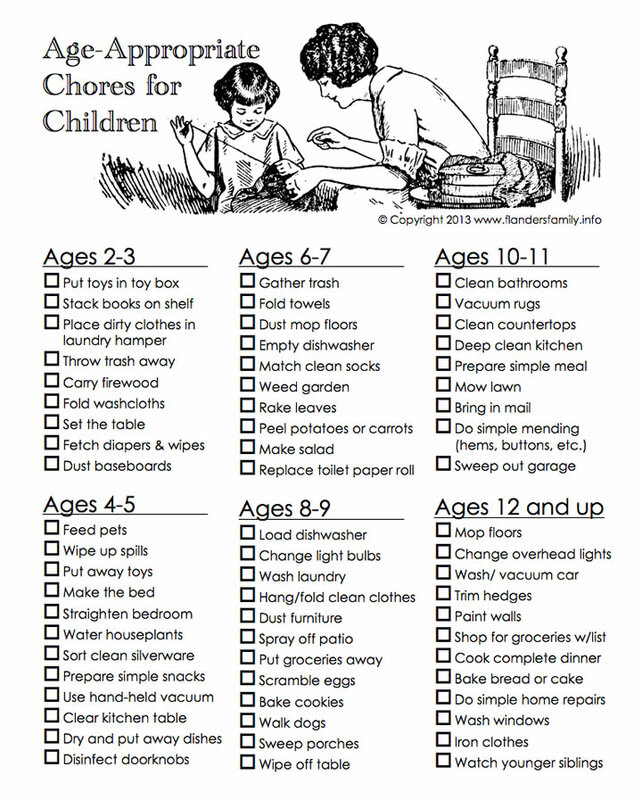 I don’t have any kids, but when I was a kid, I had chores like this. Even if I was too short, there were ways around it. I had my own step ladder tucked away that I got out and moved to different cabinets to get the dishes up high. I wonder how similar this book is to the Dave Ramsey & Rachel Cruze book Smart Money, Smart Kids. Based on your few sentences about it, it sounds like it could be pretty similar. These are a good guideline for getting your kids responsible in doing their chores. I remember having a chart we made ourselves every month with the chores we needed to do each day, and got to put a sticker on each space when we got them done – it was surprisingly motivating for a little kid! I always laugh when coworkers complain about having to go home after work to shovel snow, when they have teenagers who sat around all day on a snow day. When I suggest that’s a very teenager appropriate job, they look at me like I have three heads. We are grandparents now, our daughter went to a Montessori school back in the early 80’s but before that and continuing after that we her Dad and I always used the “team ” approach.We were and are Team McCormick”.So that meant every body helped, every body benefitted.I never thought we wouldn’t divide up jobs or tasks needing to be done.We do the same with our little grandaughter who is 3.She can do all of the items on the list and more.In my opinion it’s about an attitude. I worked nights when my daughter was growing up so I use to leave post a notes with choices of jobs to be done that day.I slept 4 hours and when I got up off we go to have fun because the jobs were done.this worked with her friends and boyfriend- all the kids helped and then shared in the good time.It was always done with a positive attitude, I always encouraged/complimented and cheered them on plus thanked them.Pride is a powerful motivator.